When I first saw this page in the papers early this month, I had wondered about it the whole day. It was the first time I had come across such an announcement. The following day The Star's report shed some light on what the ceremony was all about. 'Silent Mentors' is the term given to people who have donated their bodies for medical training and research. This is different from organ donors, living or dead. These cadavers are used for a 3-day workshop at the Minimally Invasive Laparo-Endoscopic Surgery (MILES) training centre at Universiti Malaya Medical Centre, after which they will be cremated and the ashes interred in a special memorial site at the Nilai Memorial Park. At this first memorial ceremony, doctors and students expressed their gratitude to cancer patients, Lim Kian, 67, and Low Siew Yeok, 47 for donating their bodies, and also to their families for giving their consent. Increased awareness of organ donations to save lives has led to more Malaysians pledging to donate their organs after death. Last year 27,205 did so - a jump of 37% from the previous year. However, the number of cadaver donors remain small - only 38 in 2010 and 47 in 2011. In many cultures the belief that there is life after death albeit in another realm has discouraged organ donation, especially among the Chinese. There are cases where the family refused to honor the pledge of the deceased to donate his organs. They cannot accept the thought of their loved one living on in the after-world missing an organ or two. The body must be whole and intact. 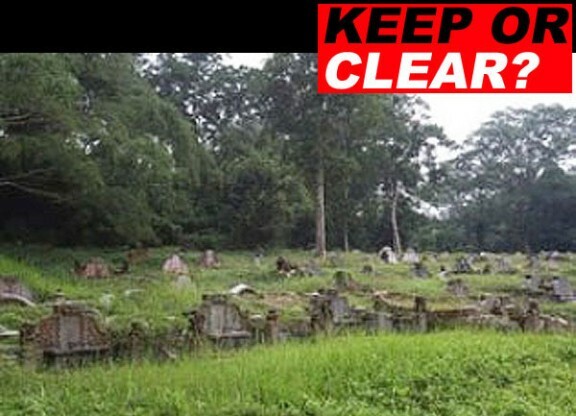 Many of these graves at Bukit Brown in Singapore will have to make way for new roads and housing projects. Times have changed. Cremation is the order of the day when death strikes. In land-scarce Singapore, burial grounds are being dug up for developmental purposes. The dead and the living are fighting for limited land, with the former losing out in this relentless march of 'progress'. That being the case, it's time for us to rethink how we want to leave when our time comes. If we can't leave a legacy, the next best thing is to leave our body or our organs so that others have a chance to live. Age isn't a barrier. There are octogenarians who are still fit and in robust health. Neither should disease pose a problem. MILES accepts cadavers of cancer patients. My donor registration card. I have pledged my heart, kidney and lungs and have informed my children to honor my pledge. That's before I knew about cadaveric donation. We have no further use for our body when we die, neither do our family members. But others may have a need for it to survive or to enjoy a better quality of life. I.m willing to donate my body to Silent Mentor programme, who should I contact. Lee Boon Wah, you could call 03-26156576. I am sure the hospital will thank you for your kind donation.